Share This Post: SEO Versus Engagement Metrics: Correlation or Causation? 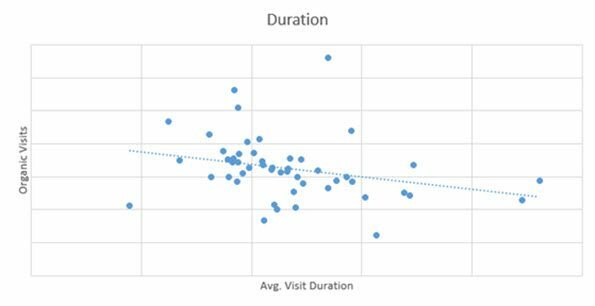 Recently, one of the SEO specialists here at Top Floor pointed out that he was seeing a correlation between engagement metrics, specifically Average Visit Duration, and SEO success. That is, in sites that are experiencing growth in Organic Traffic, a corresponding increase in Average Visit Duration was apparent. So we wanted to take a closer look for a connection between a site’s Engagement Metrics (Pages/Visit, Average Visit Duration, and Bounce Rate) and the performance of the website in Organic Search. I’m An SEO, Why Should I Care About Engagement Metrics? SEO at its very core is about driving traffic to a website, and there is still a strong sentiment in certain areas of the SEO community that once a user gets to the site, an SEO’s job is complete. I haven’t been in SEO long enough to know if that mind-frame was appropriate or accurate in the early days of SEO. All I know is that SEOs can no longer afford to think that way as search engines get smarter and continue to rely on relevancy and searchers’ intentions. So analyzing what users do once they get to your site is the best way to gauge your site’s relevancy. At first glance, this makes perfect sense. Google wants to provide their users with the best user experience (read: search results) and the more a user is engaged with the content that was served up by a search result, the better the user experience. When a user returns to the search results and clicks on a different link, this is an indicator that the first link was not what they were looking for. This type of action is referred to as “Pogo-Sticking” and is believed to be a metric that is factored into search engine algorithms. Rand Fishkin over at Moz had a great Whiteboard Friday presentation on Pogo-Sticking. In the video Rand discusses how Pogo-Sticking may be calculated. Google measures these kinds of things. So does Bing. They measure this pogo-sticking … X% of people pogo stick away from IT Boston in their first 5 seconds of visiting the site, Y% do it for this BuzzFeed page, and Z% do it for IT 101. We’re going to calculate some average, the average pogo-sticking as sorted and weighted by the ranking position for this particular search result. Long story short, user engagement is/will be a factor that needs to be monitored by SEOs. As an agency, we are in a unique position in that we have access to hundreds of Google Analytics accounts so there is quite a bit of data available at our fingertips. For the purposes of this research, we selected 50 sites so the data set was large enough to draw preliminary conclusions. We chose from sites that had no major updates (redesigns, restructurings, or additions like a blog or knowledge center) over the most recent six month period and compared that data year-over-year to remove any seasonality. We looked at changes in Organic Traffic, Pages Per Visit, Average Visit Duration, and Bounce Rate. And now for a couple of disclaimers. We deal primarily with Industrial and Manufacturing clientele that are largely B2B. Data was collected anonymously and any specific performance metrics have been stripped of labels to further ensure anonymity. 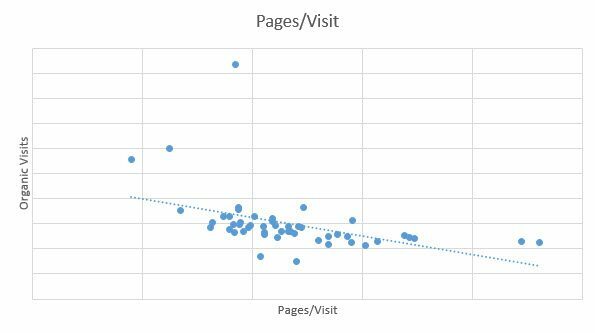 Initially, I was a bit surprised that there was a pretty significant negative correlation between Organic Visits and Pages Per Visit. But the more I thought about it, the more this makes sense. If an SEO campaign is effective in targeting the right audience with the appropriate content, a user should find the majority of what they were searching for on their entry page. There’s less time spent searching through the website to find what they seek. This is a much weaker negative correlation, but negative nonetheless. As you can see from the chart, the data is not as grouped as in the Pages/Visit graph, with many more outliers. Another factor to take into consideration is that Bounce Visits are tracked in Google Analytics as having 0:00 visit duration. As we make the shift towards trying to answer all of the user may have with the content on a landing page (as Cyrus Shepard of Moz suggests here and here), users may be spending more time digesting the content provided before leaving via a “Bounce”. Especially when you are working within a B2B vertical where the buying process is very long, these types of visits are not necessarily a failure. Now this is the data that surprised me most. 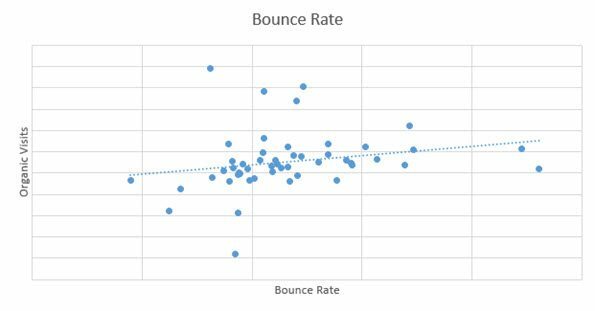 While it is a very weak correlation, there is still a positive correlation in that as Organic Traffic increased, so did the Bounce Rate. As mentioned in the previous analyses, this may not be troubling. Searchers are typically looking for very specific information, and if we successfully provide that on the landing page, they may have no further need for our site during that visit. Also, with the inability to track how long a user was on site, these Bounces could have occurred after 5 seconds, or 5 minutes. While the data did not support my hypothesis it still shed some light on how these sites are being utilized after a searcher arrives. I think as SEOs, we owe it to ourselves and our clients to look at the entire package from Visit to Conversion and everything in between. When a marketer works to improve engagement metrics, they are putting the user first and catering a web experience to them. And when you sort through all the vague statements, repetition and actions taken by search engines in the recent years and months; that is what they are looking for. A truly great experience for their customers.